Jade as dark as the deep sea. Protection permits the Narwhal to live for years as he grows his tusk. That tusk is the source of the Unicorn Fable. Julie Warenski inlayed and carved the gold Unicorn and gold Narwhal and did all of the other engraving work. Notice the tusk on the Unicorn and the tusk on the Narwhal. I supplied Julie with a piece of Narwhal tusk and she carved those out of the real thing. Authentic enough? 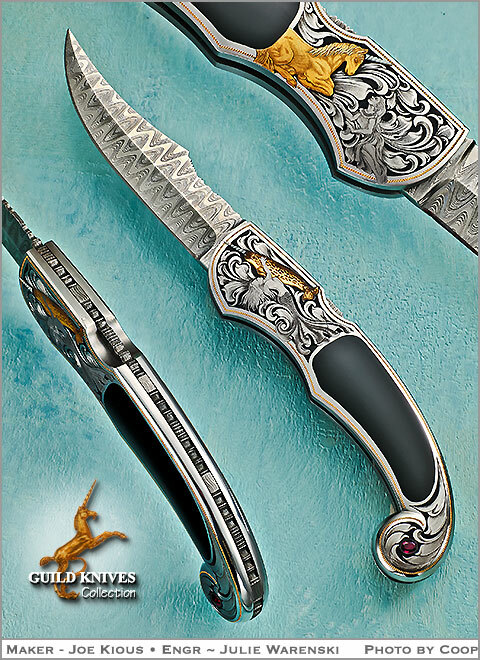 Gold bead work surounds the outside of the knife handle on both sides and the pommel is set with two faceted rubies. Take a mermaid home today. Black Jade, gold and bolino engraving, plus 2 rubies. Engraved story on each side in gold.